Like any angling activity, surf fishing requires a lot of gear. The thought of buying a new rod, reel, lures, and the multitude of other related products may seem incredibly overwhelming. In this article, we’ve put together some of our favorite products in several categories. If you’re new to surf fishing, or just in the market for new gear, we hope this article will help you make a more informed investment. Going for quality products is the easiest way to ensure longevity. Tools that are made with thoughtfully crafted materials will not only last longer than cheap metals and plastics but will also be generally more effective. Great surf fishing gear will always be corrosion-resistant, a vital aspect of saltwater gear. If you choose to go for a cheaper option, you risk buying a product that may advertise being resistant to saltwater damage but doesn’t live up to those claims. Quality-made products are often easier to operate. Because they’ve gone through rigorous testing and quality control, they’re more likely to perform in a user-friendly way. The UglyStik GX2 is a new and improved version of a classic rod many anglers have come to know and love. It features the company’s patented “UglyTech” construction in the rod blank, a technology that increases material durability without compromising sensitivity. The blank is made with a fiberglass and graphite composite. This particular line of rods comes in several different sizes, ranging from a 6-footer with light power to a 9-foot rod with medium power. UglyStik’s have come to be known for their signature clear tip, and the GX2 stays true to this feature. This tip allows for super sensitive bite detection when it comes to small fish, but also holds up to the company’s commitment to durability. The GX2 line also includes a feature that is new: one-piece guides. Instead of using their traditional ceramic guides, they upgraded to a more durable, fixed stainless steel design. Other features include a stylish black and red matte finish and comfortable foam EVA handles. Overall, the GX2 line from UglyStik is a great improvement on the rods that have come before from this brand. These rods are a great pick for a variety of skill levels and work well not only for surf fishing but for other angling styles as well. The major draw of this line is the durability of the materials, which can hold up well to saltwater fish but can also cause a little stiffness and extra weight. Created with high-quality performance and style in mind, the Battle II from Penn is a popular choice for many saltwater anglers. This 2014 release is one of many reels from the company, who have made a name for themselves in the angling world by being at the forefront of fishing technology since 1932. The Battle II comes in eight different models, from the small 1000, suitable for catching small panfish and other species, to the sizable 8000 model, a great pick for trophy fish. For durability, the reel is crafted with a full metal body, side plate, and rotor. While this does add a little extra weight, it keeps the reel in good shape for a longer period of time. To prevent corrosion from saltwater, the reel design is coated in a corrosion-resistant paint. In addition, this model also includes sealed stainless steel ball bearings to prevent sand or salt build-up from ruining the reel. 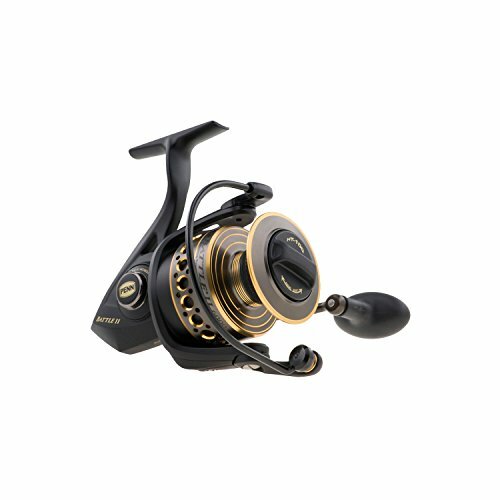 The drag system on the Battle II was altered from previous reel models to include more pressure capability. The carbon fiber drag system features washers on two sides rather than one, allowing a drag increase of 20 percent. Penn’s Battle II is a beautiful reel with very attractive features. The full metal design is great for durability, but it also adds a lot of extra weight, which can result in clunkiness. However, the pros definitely outweigh the cons in this design, and the advanced drag system is hard to beat. While I wouldn’t necessarily recommend this to a beginner, anglers with more experience will enjoy the Battle II. Penn’s most popular rod and reel combination, the Battle II, has earned high marks from many surf anglers for its ideal balance of sensitivity and power. The blank is crafted with a high-quality graphite composite blend. This particular combination of materials helps the rod detect subtle bites from smaller catches, but also can hold its own with the pressure of a huge fish on the end of the line. 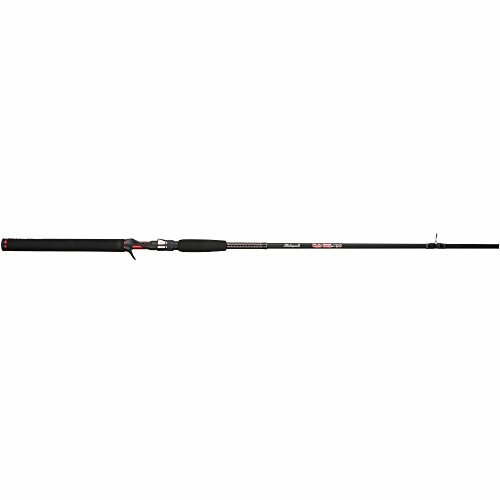 Penn offers several different sizes for this rod, including a 6-foot rod with medium light power and a 10-foot heavy power design. The rods are fitted with EVA foam handles and aluminum oxide guides. The reel included is the Battle II, mentioned in the previous section. It features a full metal body, rotor and side plate, and an anodized aluminum spool. The drag system is carbon fiber, equipped with heavy-duty “HT-100 Versa Drag carbon fiber washers.” It has a line capacity of 200 yards, a steel bearing system with anti-reverse, aluminum bail wire, and line capacity rings. The Penn Battle rod/reel combo is the ideal pick for anglers who are looking for a little more versatility in their fishing gear. While this isn’t the best combo for a specific action, it brings some great, general features to the table that can enhance your performance in a variety of angling activities. If you’ve used fishing lures before, you’ll be familiar with the name Acme. One of the most notable and popular brands for lures, this company has fishing down to a science. The Kastmaster lure is one that many anglers grow up using thanks to its versatility and all-around effective performance. The Kastmaster’s design has barely been altered since the 1950s. It’s a traditional spoon lure that comes in a wide variety of colors and designs. From the simple chrome to flashy neon yellow to copper, there is something for everyone (or every fish). These lures are ideal for use in saltwater as they are crafted from solid brass, which remains tough in the face of potential corrosion. This material is also durable and doesn’t easily bend or break, so the lures can last for years. Kastmasters are created to imitate an injured baitfish. Their lightweight designs make them ideal for casting super long distances and they’re effective for trolling, jigging, and everything in between. The Kastmaster lure is tried and true. This design has been used for decades, and for good reason—it works. While it may take a little practice to get the ideal action to catch your targeted fish species, overall, these lures are a great pick for anglers of all skill levels. Whether you’re planning on surf fishing or heading to your local freshwater lake, the Kastmaster’s quality can take it all. With the goal of creating affordable products that are accessible for a wide array of skill-levels, Handing is a company that many have come to respect. Their braided fishing line is a great choice for surf fishing thanks to its durability, color choice, and sensitivity. Their fishing line comes in multiple color choices, ranging from a candy-colored blue to multicolor to a forest green. Each spool of the Handing line is braided together with eight separate durable strands. The strands are created from “MultiTuf PE fibers,” high-quality, but affordable, material that can hold up well to the corrosive nature of saltwater. It also includes added wear resistance. This line is advertised as “ultra sensitive,” which comes from a lack of stretch in line’s core. This stiffness results in a sensitivity that makes it easy to detect small bites, and allows the angler more power in reeling in large catches. The line is coated with an extra smooth finish that assists in casting by reducing friction with guide rings. 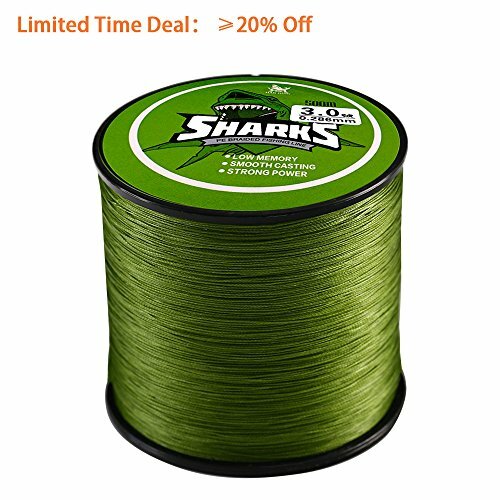 There may be higher-quality fishing lines on the market, but for the affordable price it comes at, this product is a great value. For the most part, it holds it’s own in competition with more popular brands on the market. The main complaint from users with the line is that the strength capacity isn’t as advertised, so consider using this line for hunting smaller fish species—it’s got great sensitivity and can detect small bites. The traditional fishing vest really won’t cut it for surf fishing, an angling activity that requires quite a bit of gear. This particular fishing bag from Piscifun is great because it’s multifunctional. 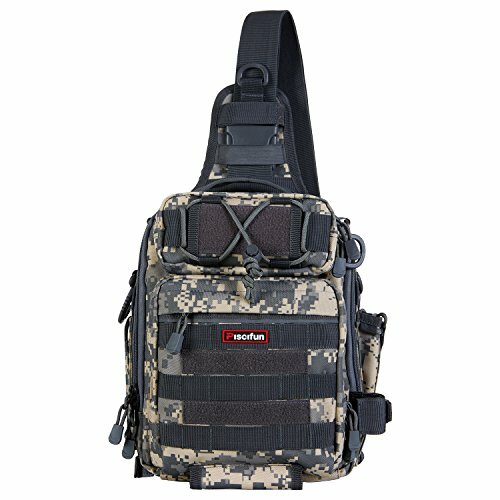 It can be used as a sling shoulder pack, backpack, handbag, and more. The adjustable straps allow the user to pick the style that would best suit them. It also includes a rod belt on either side for easy transportation. The bag features several compartments of varying sizes for all sizes of gear. The sizable main compartment has three layers, and there is also an adjustable water bottle pocket and a bottom pocket for easy accessibility. This pack was created with water-resistant nylon fabrics. It also includes corrosion-resistant full-length SBS zippers and an “indestructible” KAM buckle. For extra comfort and structure, the pack includes a padded hand strap. An added benefit to this bag is the reflective light sticker, which adds an extra element of safety when going to and from the beach, especially when fishing at night. This multifunctional pack from Piscifun is a great choice for surf anglers who want to be able to customize their bag from day-to-day. The pack is versatile, makes needed gear easily accessible, and has a good amount of varied storage space. This bag does run a little small if you have a ton of gear to carry around and it could use a little more shoulder padding, but for the price, this pack is a great value. If you’ve spent time on the beach, you’ve probably passed surf anglers in lawn or camping chairs, chilling next to their rods, waiting for the sight of a line wiggle. This effortless style of surf angling is thanks to a sand spike, the tool that keeps a rod in a stationary place on the beach. The Sea Striker sand spike is a pretty classic version of the tool. It’s 28 inches long and is made of PVC. The PVC is made with a high-impact, corrosion resistant plastic. It features one-piece construction for easy setup and an aluminum stop pin. Simply stick the Sea Striker in the sand, and it will keep your rod solid and steady while you relax. 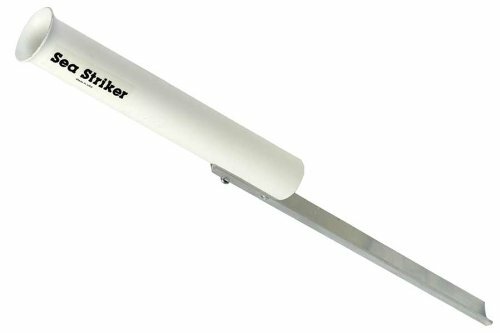 For the most part, the Sea Striker sand spike is a great choice for many surf anglers. While there are some more durable choices on the market, and this design is a little short for some tastes, it comes at an unbeatable price. This is also a good option for anglers who hope to fish in other settings as well, as it can handle dirt or gritty sand with ease. 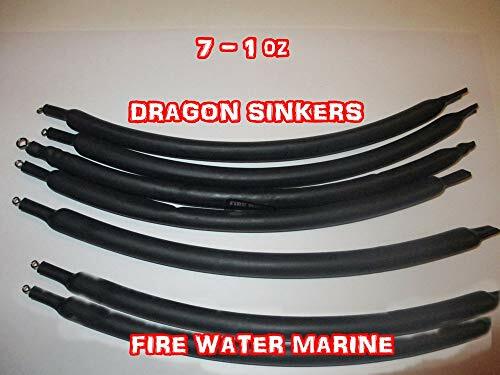 Fire Water Marine is a company that specializes in creating specialized underwater LED lights for watercraft, but they also have tried their hand at other angling products, such as dragging drift sinkers. While these were created specifically for fishing catfish, they work well for surf fishing as well. They feature a very unique design, measuring 10 inches in length. They come in three different weight sizes: 1 oz., 2 oz., and 4 oz. These sinkers were crafted to be virtually “snagless”; although the company admits that no weight can truly achieve that, these do come close. They are made with dual layer marine rubber and metallic balls for weight. The balls produce a rattling sound, which can attract curious predators. The smooth design also allows the weights to make their way through complicated underwater terrain without snagging. Each sinker comes with a stainless steel attachment for easy rig construction. This unique weight with an innovative design has the potential to bring you great angling success. The construction of the weight holds up well to the promise of the company, and rarely snags on underwater structures. While it is a little clunky and has a bit of a learning curve casting-wise, this weight has several features that make it an attractive purchase. Helly Hansen is a Norway-based company that has made serious strides in the realm of waterproof clothing. The Roan Anorak is one of several lines of jackets that the company carries. This particular product comes in only one color and style, a combination of a deep mustard yellow and black. It’s created with completely waterproof material, an important feature for surf fishing, especially on wet and windy days. The material is 100 percent polyester and features a three-layer design to keep heat in and water out. The jacket is also oil-resistant, which is great for fishing, as experienced anglers know that, at times, it’s a messy process. The piece comes in several different sizes, but it also has an adjustable fit. It features a hem drawcord adjustment as well as a hood drawcord adjustment. Other features include neoprene cuffs, a half zip opening, and a chest pocket and flap. 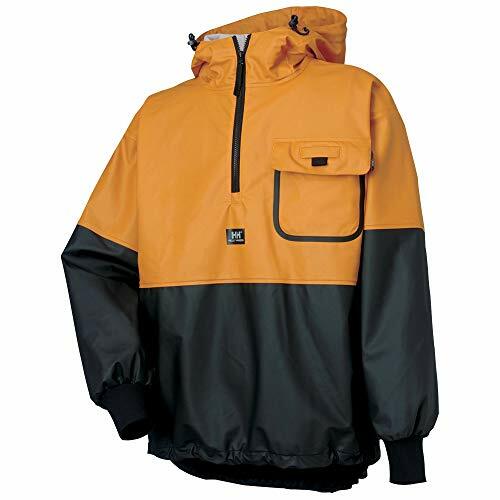 The Helly Hansen Roan Anorak jacket is a heavy duty piece of outerwear for a serious angler. This is a great surf fishing pick thanks to its durable, high-quality material and waterproof construction. While it only comes in one color and style, and some are not fans of the half-zip style, if you don’t mind it, this might be the jacket for you. Arguably the most important piece of gear that you’ll be bringing to the beach is your rod and reel combination. If you choose to splurge on anything, this is where you’ll want to spend your money. Above all, make sure you go for a powerful, durable rod that can handle saltwater and a reel that can cast effortlessly. Some anglers prefer to use live bait over lures or vice versa, but neither truly trumps the other. If you’re in search of a trophy fish, you’ll probably want to go for live bait, like mullet fish, shrimp, or live crabs. Lures are the more popular choice because they require less maintenance and they can be used over and over again. Fishing line variations are also very important to be aware of. There are three popular choices for surf angling: monofilament, fluorocarbon, and braided line. We’re quick to recommend a braided line for saltwater fishing, as they are super strong and can handle fish of all sizes. If you’re taking your first steps as a surf angler, or even if you’re an experienced surf angler searching for new gear, we hope that this guide gave you some ideas for fishing products that might be right for you. Always remember: quality is key, and the fish are waiting. Happy fishing!